There’s general agreement that the club that became Arsenal was formed in December 1886, 124 years ago. Most histories of the club give details of several men who played a leading role in the club from this earliest moment. But my personal view (and one that through this site I am exploring as we unravel the history of the club) is that one man stands out above all the others. He is the man who made of great principle who made Arsenal his life, and who stayed with the club almost until his dying day. He is also the man who at two key moments was involved in the decisions that ensured that Arsenal not just survived, but grew. He is Jack Humble. This article is a bringing together as a summary the many references to to Jack that appear on this site, and will be, I hope, a stepping stone to more discoveries about him. Through the amazing hard work and resourcefulness of Andy Kelly, a great friend to this site, I have been able to find sufficient information to put forward my view that Jack Humble was indeed the true founder of Arsenal FC, a man whose bust should stand alongside those of Herbert Chapman in the club, and for whom a statue should be built (again along side Herbert Chapman) on one podium, outside the stadium. He is also the man whose memory should also be celebrated in the fullest possible fashion in December 2011 – the 125th anniversary of the foundation of our club. The article does not reiterate all the data gathered on this site in the past couple of years about Jack Humble. Nor does it deal in detail with Jack’s input after the early years. This is, in fact, the start of a work in progress; the book “Woolwich Arsenal, the club that changed football”, which I hope to publish next year. The foundation of Arsenal was laid with Dial Square FC which quickly mutated into Royal Arsenal. Woolwich Arsenal was born in 1891, and after two years of playing friendlies, (while trying to form the new Southern League) they were admitted to the Football League to play their first league game on September 2, 1893. Frederick William Beardsley (1856 – 1939) born in Nottingham and worked in the munitions factor, he played as an amateur in goal for Nottingham Forest. Joined Woolwich Union FC when he moved to the area, then met up with David Danskin and Jack Humble and together they formed Dial Square, with Beardsley in goal for the first game. Various reports suggest that Beardsley acted as a club committee member while a player, and in 1891 he was elected club vice-chairman (although one source doesn’t have him on the board until much later). He then served on the club’s board of directors for the next 20 years, and worked as a talent scout. He left finally in 1910 when the original club was wound up and a new club was formed by Norris. Joseph Morris Bates (1864 – September 6, 1905), first played as an amateur for Nottingham Forest, before moving to work at the Royal Arsenal in Woolwich (along with Fred Beardsley). Bates was a referee and reputed to be responsible for obtaining a set of red kit from their old club Nottingham Forest. Bates played 73 first-team matches for Royal Arsenal including the very first FA Cup tie, against Lyndhurst in 1889). He was the first captain, and as such won the first trophy: the Kent Senior Cup and London Charity Cup in 1890. When he retired as a player, he left the club and retained no connections with the organisation. David Danskin (another of the Forest players) stood for election to the committee in 1892 but was not elected, and so left Arsenal and moved on to working for Royal Ordnance Factories FC, the club that split away from Arsenal over the argument of professionalism. However Royal Ordnance Factories failed as a club and Danskin retained connections with Woolwich Arsenal. So if we consider these three men we find that although all were involved at the start, Bates left when he finished as a player, Danskin left for the rival club Royal Ordnance Factories over the issue of professionalism, and Beardsley left when Norris turned up in 1910. Jack Humble was born in Hartburn, (today a suburb of Stockton on Tees), County Durham, and moved to London in 1880 to work at the Royal Arsenal. The importance of Royal Arsenal in the country’s culture and history at this time cannot be over-estimated. For in an era of wars involving the UK it was one of (and by far the largest of) only three royal munitions factories. Year on year The Royal Arsenal grew, employing over 25000 workers in its various plants in Woolwich and across Plumstead Marshes. The story is that Jack and his brother walked around 400 miles from their village to the Royal Arsenal, although as yet we have no clear evidence that this is more than an invented media tale. But we do know that Jack was a member of local socialist parties, who believed in workers’ rights, shorter working hours and more time for leisure activities, including of course football. As such he moved south not only to find work but to be with like minded people, for in 1868 the Royal Arsenal Co-operative Society had been formed by workers at the Royal Arsenal. The area was a centre of the new thinking concerning the rights of the working man. We know that Jack Humble wanted the club to become professional, but through the work of Andy Kelly we also know that some of the stories surrounding Jack and this move are quite untrue. For example it is said that in 1891 Derby County tried to recruit two Royal Arsenal players to play for them, following a cup game, and that as an almost knee-jerk reaction Jack Humble decided it was time for Arsenal to go professional. It makes a nice tale, but is simply untrue. The official histories state that Peter Connolly and Bob Buist were approached by John Goodall of Derby after the Arsenal/Derby game on 17 January 1891. But Bob Buist didn’t join Arsenal until September 1891 – 9 months later. The team that played Derby was: Bee, Connolly, McBean, Howat, Stewart, Julian, Meggs, Christmas, Barbour, Offer, Gloak. Like so many early stories about Arsenal, the details are all wrong. Jack Humble did however propose professionalism. He is shown as being on the committee for 18901/1 and at the 1891 AGM, he made the first proposal for paying the players (although he was not in favour of turning the club into a limited company – he wanted to use the co-operative model). Here’s one other story from the era. It is also said that upon Arsenal’s move to professionalism the rest of the London and Kent footballing world refused to play the club. What actually happened was that with great dignity and honour Arsenal offered to resign from the associations of which they were members in case there should be a problem with them playing as professionals, but the offer was declined, and Arsenal continued to play the same teams as they had played before. Virtually all the fixtures that they had planned prior to adopting professionalism, were played as planned. I mention this point as an example of just how great is the need for the re-writing of Arsenal’s history – for the standard texts (which relegate Jack Humble to the position of also-ran) – are full of issues like this. As it was, after the abortive attempt to form a Southern League, Arsenal were the first southern club to join the Football League with Jack Humble as a director. This could only have happened had Jack Humble pushed through the creation of the professional club two years earlier. 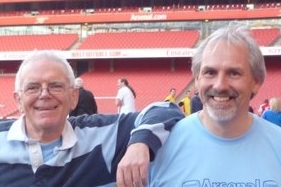 Without his guidance and inspiration there would either be no Arsenal today, or else the club would be playing in the Kent leagues as a semi-pro team. Indeed it is not unreasonable to say that this is one of the two most important and utterly fundamental moments in Arsenal’s history, which each defined our future – and Jack was there in both cases. The first is going pro in 1891, leading to joining the league in 1893 (again with Jack Humble at the fore). The second was the decision to pull out of Plumstead and move to Highbury, at which time Jack was not only the sole member of the original founders who was still at the club – he was the only director who had been there in 1891, and was still with the club. And in case there is ever any doubt about the need to move, we should remember that the club ended its time in Plumstead playing in front of 3,000 people. In short: two totally defining moments at each of which, had the key decision gone the other way, the club would have collapsed, and at both moments Jack Humble was there as a director. As I said at the start, I am not going to cover all of Jack’s history here, but here’s a thought. Jack Humble was the socialist who didn’t even want the club to be a limited company since it would set it apart from working men, a club founder and a director of the club from the earliest days. And yet from 1910 until the fall of Henry Norris, he worked with Norris day by day. Although from similar working class origins to Jack, Norris became a property developer who owned most of Fulham, joined the Unionist (ie Conservative) Party, was an active Mason, became Mayor of Fulham, and then got knighted for his efforts in the war at recruiting young men to fight in the trenches. Can we even start to conceive what the board meetings must have been like? These two together as directors is just impossible to imagine – and yet not only did Jack Humble stay on as a director when the new company was formed, he stayed through all the events that followed. Uniquely he not only laid the foundations of the club, and the foundations of the original club, the worked with Norris to rebuild the club after it went into administration in 1910. That such a monumental set of achievements is not recorded at Arsenal stadium is hard to contemplate. I will conclude this resume by jumping to the end. Jack stayed as a director until 1929, when Sir Henry Norris fell from power, having lost a libel case against the Daily Mail. Jack Humble resigned too, although it is not clear that there was any reason for him to do so – he was certainly never implicated in the issues that were at the heart of the libel case. He was however able to watch Arsenal’s FA Cup win of 1930, and died on 18 December 1931 leaving £1358 9s 9d to his widow and his eldest son. That then is the start of why I am campaigning for Jack Humble to be recognised by the club. But let me leave you, if I may, with one other snippet, which shows just how deep his involvement was. One of the many false statements about Jack in the reference works that mention him, is that which says he did not play for Arsenal. In fact he did, and once again we must thank Andy Kelly for correcting the errors of others. Jack also played for the Reserves in the early years. This, as I have said, is just the start of the story of Jack Humble. I hope to have more information soon – and to make progress with the big project: getting the club to recognise the supreme importance of this man in the history of Arsenal. first time I’m posting on here, but I always try to read your blog. Always a great source of history of our beloved Arsenal. One thing I want to ask you: where do you take these informations from? The information comes from the various books published on Arsenal, and then detailed checking with any source I can find. Andy is the brilliant one – he ploughs through endless newspaper articles and the census data to find people. I just wander around and look. To give you one simple example… With the story about Derby trying to attract away two Arsenal players, causing Arsenal to become professional, Andy was seemingly the first person to bother and check that story against the team that played that day – and found that one of those players supposedly in the story, wasn’t even playing. I am not sure why but I just thought I might look it up. I found a history of the ferry, and found there was no ferry in 1886, which then made me think, this is another story that people are just repeating without checking. So I started to check each detail – such as what time would you have to kick off a match in December in London, if you wanted to finish before it got dark… and so on. That’s how I do it. Andy do you want to give away any of your secrets? In the early 1990s I had a lot of spare time and spent most of it at the newspaper library in Colindale trawling through old newspapers. I’ve also got a big collection of programmes and books written about the club. I started researching my family history about 8 years ago. One side of the family has been particuarly difficult to trace which means that I have had to come up with “out of the box thinking” to discover information. This has helped with coming up with information on the early personalities of the club. It’s only since I’ve been reading Tony’s blog that it dawned on me that maybe things were different than had been reported. What has surprised me most is how much information that I never realised that I had in my possession for years that supports what we have put on here. It’s hard to overstate the importance of Jack Humble. Until now, he has only ever had a passing mention in the club’s history. Tony is right in that now we should be recognising what this man did for the club. It’s bad that he was forgotten. Maybe someone took his name a little too seriously. But it’s good that he lived long enough to see the club’s first FA Cup win and first League title in the months before he died. thank you for all the information, it’s always nice to read some history facts about Arsenal here. Maybe all these texts can be put on a book, have you thought about it sometime? I adore to know facts about Arsenal history, and the other blog about modern facts and pro-wenger is great as well. I’m the chairperson at Arsenal Brasil Official Supporters Club and I’d like to know if you allow me to translate your texts about Arsenal history into Portuguese and collect them as a great source of informations for our members. It would be great, and of course, all the rights would be yours. Thank you! Further digging around seems to show why Jack and his brother Arthur left Stockton. It looks like their father was declared bankrupt in 1881. He committed suicide on 17 March that year. That left Arthur as head of the house with 5 siblings aged 11 to 22. I can only assume that Arthur and Jack decided that they wouldn’t be able to support the family living in Stockton so they had to seek work elsewhere. a) At the start of each piece you must include the author’s name. On this site the articles are all “by Tony Attwood”. If you are quoting from Untold Arsenal, the name of the author is given at the top of each article. b) You must put at the start or the end of the piece that the original appeared on http://www.blog.woolwicharsenal.co.uk – The Arsenal History Site, and that it is translated with the permission of the copyright owners. c) Let me know when you do a translation. I regret I don’t speak Portuguese but I do like to keep track of where our articles are used. Just a short email to tony.attwood@aisa.org each time you publish, telling me the web site address. I hope that does not cause you any problems. And many thanks for your interest. Can I put a question back to you. What is the view of supporters in Brazil about Denilson? Can you write to me at tony.attwood@aisa.org with the answer to that one, as it is not a historical question! Andy this is most moving and shocking. But thank you as always for finding this out. Thank you a lot about allowing me to translate your texts! be sure I’ll attend your conditions, because I really always wanted to have some good points of Arsenal History and now I found your website and your good sources of informations! Everytime I translate something, I’ll email you. By the time, I’d like you to know our website and the job we’re having at Arsenal Brasil O.S.C. : http://www.arsenalbrasil.com.br (try to put it on google translator and read our articles). We also have threads on our Forum focused on English people that want to chat with us. It would be great to have your thoughts over there! About Denilson:I’ll send to you by email the thoughts of brazilian supporters about him! Some of our members are going to London next week and we’ll try to meet him at the Stadium to have an interview with him, just as we did with Edu Gaspar (unbeaten legend). Interesting – here I am looking through this extremely informative article for any more bits & pieces I can glean on Jack Humble (from a genealogy point of view), and I see the link given by Andy (21 Dec 9.13pm) is to MY own pages on a family history website! It seems I’ve turned full circle!! By the way, does anyone happen to have a photo of Jack? I have some pix of Jack becuase he was my great grandfather – what’s your connection ? As a Teessider who moved south for similar economic reasons and finding himself supporting Arsenal I find this story amazing. Does anyone know where Jack is buried? Brilliant article, I’ve read quite a bit about the history of AFC & am now confused to have some of the things I’ve read revealed to be myth! The truth will out some time I guess. Stumbled across this particular article after specifically looking on a well known search engine for Jack Humble. One of my best friends is a descendant of him & his father still has a dressing table bearing a plaque saying it was given to Jack Humble by Arsenal FC for his services, I think the dresser dates back to about 1920 or thereabouts. I’m sure my friend, who’s surname is Humble (& is obviously a loyal Gooner), would be very proud if there ever was a statue or bust of his Great grandfather. Maybe I should also put my mate in touch with Karen & Philippa! Jack Humble is my Great Uncle his brother my grandfather immigrated to the US in 1910. it’s good to read that all the Humble’s have been feisty in nature. Daniel, was your grandfather Arthur Humble? My great grand father was Fred Humble and was jack’s brother. He came to the US in 1910. His son Sid Humble was my grandfather. He died in 1964. Phillipa – I’m guessing you descend via Dorothy Grace Humble? Sorry for the delay, I’ve only just seen your response. My connection? I’m doing a family tree for my sister-in-law, she descends from Jack Humble’s brother, Fred, who was her g/grandfather. Scott – interesting that you mention the piece of furniture bearing a plaque – I have heard this story before! We are all very excited about the prospect of a statue! sorry for 6 month’d delay – oops – Yes Grace as she was known was my granny – a beautiful and feisty woman. She had two children with her husband Reginald Dawson; my pa Anthony – who looks very like Jack and his sister Jean. Interestingly Grace and Reginald also emigrated to the USA where he won a medal of honour from the US government for scientific research which helped win the war. Also – and this is spooky – my pa also became a weapon’s inspector at the Woolwhich Arsenal and worked for Nato in Norway – following in his grandpa Jack Humble’s footsteps. I’m trying to get the family archives from my US cousins – VERY SLOW WORK – but when I find out more I’ll let everyone know. The Norris/Humble relationship has similar feeling to present day management intrigues.Fascinating. Re Fred Beardsley a founder of Woolwich Arenal – have read several mini-biogs about him but none mention he was ten years a Football League referee as listed in the FL Rulebooks of the time (1894 to 1903) His address is always given as 5 Coxwell Road, Plumstead, which is mentioned in the mini-biogs. Has anyone ever come across this sideline of Fred’s? Indeed you are right. I’ll dig out some match reports to see if I can find some matches that he officiated. It’s also something that we should add to his biography for our next book about Royal Arsenal. His refereeing is mentioned in Alan Roper’s “The Real Arsenal” but only as an aside for 1895 on page 116. An OT here. In looking through the news this morning, I ran across a page at Portadown Times, which has a 1937 picture with an Arsenal connection. Or, at least I hope this page is relevent to Arsenal history. My great grandfather Fred, Jack’s brother died in or near Sacramento Ca around 1930 plus. One of his brothers immigrated to Canada around 1919, not sure on the name my Dad may know. They all came from Stockton on Tees. Fred was a butcher and retired his business before coming to Rio Linda Ca. At any rate we have a school teacher Cousin sill in England which we have lost the telephone number. Off the subject but I appreciate any family tree info. Croxwell Road is a couple of streets down from Hector Street which is famous for still having terracing from the old Invicta Ground that Arsenal played at in 1890s. Fred Beardsley would have most probably have walked past the Invicta Ground on his way to work everyday at the Munitions factory (The Arsenal).